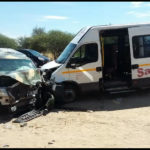 SIX people sustained various degrees of injuries after a partial head-on collision between a minibus taxi and a Namibian Defence Force vehicle earlier on Sunday. A Namibian Defence Force vehicle that was part of a convoy returning from the funeral service of the late King Immanuel Kauluma Elifas at the old cemetery Olukonda was allegedly responsible for the partial head-on collision. Eyewitnesses to the incident said the driver of the NDF vehicle was driving erratically and was swerving from side to side over the road before he crashed into an Iveco mini bus. The accident occurred on the main road between Omuthiya and Oshivelo. The six injured occupants of the vehicle were rushed to the Omuthiya hospital for further care and treatment.